I use to think essential oils was just another marketing scheme designed to take all my money. And although I’m not so sure about some of the claims behind oils, I’m more of a believer in them now that I’ve actually used some. My first experience with essential oils was during a study abroad trip across the world to New Zealand. A few of the girls, myself included, had some digestion issues (oh the joys of sitting on a plane for 14 hours) and were desperate for something to get things, well, moving again. One of the girls suggested essential oils and gave us a drop to rub on our tummies. I don’t remember which oil it was and at the time I thought it was a little silly, but surprisingly the next morning all was back to normal! Now I don’t know if it was the essential oil that actually worked or my body just finally adapting to its new time schedule. But after that, I thought maybe essential oils weren’t so crazy after all. I once had a yoga teacher who at the end of every yoga class would rub a little grapefruit essential oil on her hands and give everyone in the class a little temple and neck massage. It was absolutely divine! I got some of my own grapefruit EO after that and would just rub it on my temples and neck when I wanted a little pick me up. Grapefruit and other citrus EO are very energizing. The aroma can literally lift your spirits and help you make it through a stressful day. 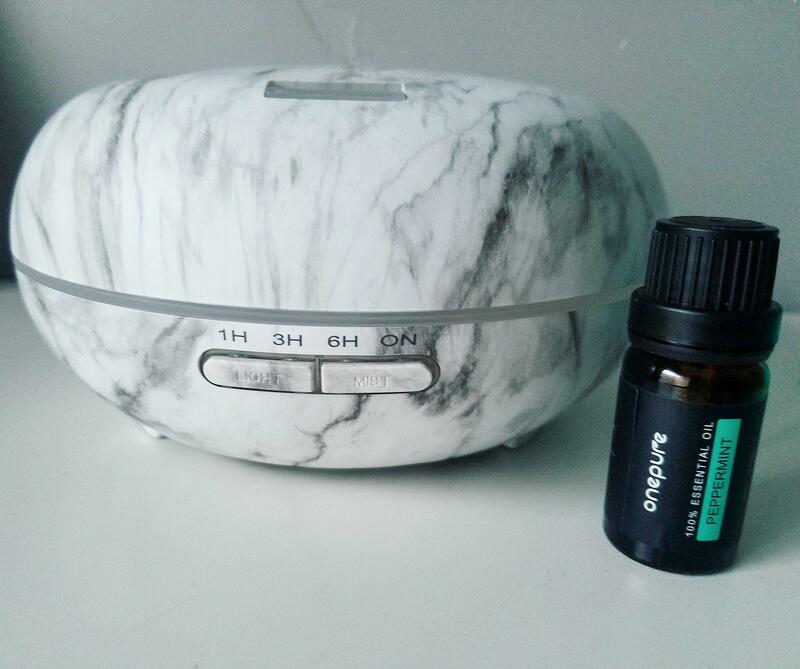 Peppermint is refreshing, cleansing, and my favorite EO to diffuse. It helps clear up stuffy sinuses and can help with headaches and sore muscles. I’ve used peppermint lots of times for my husband’s headaches and migraine and they help most of the time. I just rub a few drops on his temples or neck and have him take deep breaths. If nothing else a massage helps distract him from his headache and provides temporary relief. I once got a bottle of lavender EO for free from a popular company. I heard lavender could help with sleep so I put a few drops on my pillowcase one night to give it a try. It was probably just a coincidence, but I had terrible dreams that night! I was afraid to try lavender again after that. Lavender is very calming, soothing, and I’ve heard it’s great in baths. Just be careful with how much you add to your bath because it can irritate the skin if you add too much. Eucalyptus is similar to peppermint in that it is super refreshing and cleansing. It’s a little more earthy than peppermint and another one I like to diffuse often. It’s great for helping your home smell fresh and helps with congestion! I’ve also read you can use eucalyptus with coconut oil in your hair to nourish your hair and scalp. Like I’ve mentioned above, I primarily use EO for aromatherapy in a diffuser. Here is a link to the diffusers I got on Amazon. I love both of them! Occasionally I’ll use EO on the skin like for a massage. I usually use a carrier oil along with it so it rubs in better and gets absorbed. I’ve also used essential oils in homemade deodorant and it worked pretty decent. I haven’t tried it, but I’ve heard that citrus EO like lemon and orange are great to use in homemade and natural cleaning products. However you decide to use essential oils, just be sure to do your research on what will be safe and best for you! Keep in mind that big essential oil companies can get away with saying quite a bit in their marketing because they have the money to deal with the FDA getting after them. Don’t believe everything you read! Overall I believe essential oils are safe and can be very effective when used for their aroma. What are your favorite essential oils? Let me know in the comments the ones I need to try!